What a great needleworking shop! We headed to Cleveland for a Tribe game and stopped at The Crafty Ewe on the way. What a beautiful place! Great selection of patterns, floss, fabric, frames, and all kinds of stitching goodies. The staff was so friendly and helpful. Can't wait to go back! I drove up after "googling" needlework shops hoping to find a particular thread for punch needle. By the time I found the shop it was 15 mins to closing. I didn't really find the thread, but found so much more. The lady that helped me was so nice and was no where near upset that I was there 15 mins until she closed and made me feel so welcomed. I will drive the 40 mins again just to visit this shop for supplies and hopefully classes. Awesome cross stitch shop....one of the best I've ever been! I really loved that they had their patterns so organized and easy to find exactly what I was looking for. And the stitched models are just beautiful! The ladies that work there, are so nice and helpful. I'm from Michigan and next time I'm in Ohio, I'll be sure and stop again! Wow, this is a great place!! It was my first stop on my 1st ever Tour de Stitch. Such friendly people in a great shop. So many great projects to choose from too. Fabric, threads, kits, and so much more. I look forward to coming here again!!! 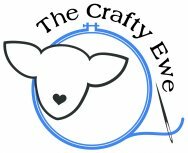 Love the Crafty Ewe. The store has always been my favorite cross stitch shop. Lots of new classes and ideas will surely equal surely mean success for 2017 and beyond. Stop by and visit....you won't be disappointed. Great cross stitch shop....lots of different notions, good chart and fabric selection. So many things to look at! One of my favorites! Love to shop at the Crafty Ewe. Wonderful patterns and threads. All of your framing needs. I'm so glad that I found this great shop! I was able to get everything I needed for my next project in just a few minutes. I can't wait to take my finished project back to have it professionally framed! Carol is wonderful and I definitely recommend the Crafty Ewe for your go to crosd stitch shop. Wish I could see it live and in person. I LOVE this store.. even just love stopping in to say hello. These ladies taught me HOW to cross stitch.